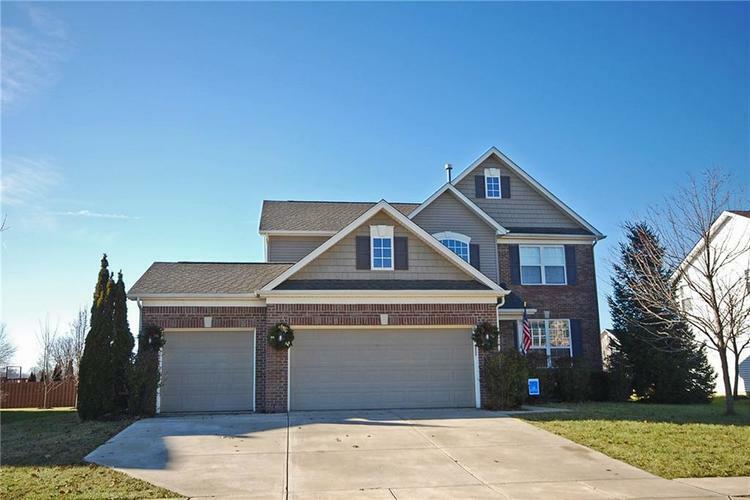 Fantastic 4 bedroom Noblesville home with a finished basement and 3 car garage on a cul-de-sac lot. Move in ready, well maintained home. Impressive 2-story entry and main floor office space. Huge Family Room with gas fire place open to the kitchen and breakfast area ideal for everyday living. Cherry cabinets with center island along with custom backsplash and large walk in pantry. Formal Dining Room for entertaining. Master bedroom retreat with tray ceilings and en-suite bath. Additional 3 spacious bedrooms upstairs. Convenient laundry upstairs. Over 1,000 square foot basement with half bath and storage area. Enjoy outdoor living with a fully fenced backyard and wood deck. A great place to call home! Directions:LITTLE CHICAGO RD & S.R. 32, NORTH ON LITTLE CHICAGO RD TO ENTRANCE OF MILL GROVE ON PLANER DRIVE, RIGHT ON PILOT MILLS TO HOME ON THE RIGHT IN THE CUL-DE-SAC.